Keywords: Atrazine kinetics degradation; Andisols; cow manure. The liquid cow manures (LCM) are used as amendments applied for soil, increasing organic matter, nutrient levels and also constitute a form disposal of animal wastes. This contributes to soil fertility, nutrient cycling and to prevent pollution of waters resources as rivers and streams near to the dairy farms. Incorporating LCM includes a high density of microorganisms that are directly involved in stabilization processes in amended soils. This soil amended condition determine, the bioavailability of several pesticides and the effectiveness in their action mechanism. Atrazine is an herbicide that belongs to the triazines chemical group, which experiment various degradation processes. The aim of this study was to establish the effect of the LCM dose and the incubation time of amended andisol on the kinetics of atrazine degradation. The Andisol belong to Los Lagos series, located in Futrono, Los Rios region. The LCM was obtained from the same place. The herbicide corresponded to an atrazine analytical standard (98% purity). Four mixtures of soil with LCM were incubated, applying LCM dose like field conditions: 0 (DO), 100 (Dl), 200 (D2) and 300 thousand L ha-1(D3), during 1, 5, 10, 20 and 30 days. Then, atrazine was applied in field dose (3 L ha-1). The kinetics of degradation was evaluated at 1, 5, 10, 20 and 30 days. Atrazine was quantified using high performance liquid chromatography (HPLC). This study showed that atrazine degradation is strongly influenced by the incubation time of mixtures soil and LCM and LCM dose. Amended soils with one day of incubation showed a high amount of extractable atrazine, suggesting that the microorganisms used initially organic material and N available in soil. At 10 and 20 days of incubation the amended soils presented a lower percentage of extractable atrazine than soil. It could indicate that alongside other process atrazine would be degraded. At 30 days of incubation there are not significant differences of extractable atrazine respect to the unamended soil. In general, D3 mixture showed a lower amount of extractable atrazine, probably due to adsorption processes that involve dissolving organic matter from LCM. These results suggest that the incubation time is a fundamental condition to atrazine effectiveness, and then atrazine could not be applied before 30 days from LCM disposal on soil. Probably, the LCM influence atrazine degradation due to, both nutrients and microorganisms present in it. Another important effect on bioavailability of atrazine is produce by a high amount of dissolved organic matter that is incorporate when excessively LCM disposal on soil was realized. Acknowledgments: FONDECYT 1070568 andDI08-2014 projects. Keywords: Andisols; sewage sludge; phosphorus. The objective of this work was to evaluate the effect of incubation on phosphorus (P) chemical forms in two Andisols (Nueva Braunau and Diguillin) treated with sewage sludge (SS). Incubation was carried out in pots of 10-cm diameter and 8-cm length filled with 625 cc of soil. Treatment involves a mixture of soil with SS (from El Trebal wastewater treatment plant). Sewage sludge was applied at a rate equivalent to 15 ton ha-1 and 30 ton ha-1 according to NCh2880 for agricultural soils and degraded soils respectively. A third treatment with a SS application of 60 ton ha-1 was also included. All pots were incubated at 25°C for four months and watered weekly to keep the soils close to their water holding capacity. All pots were allowed to drain freely. Experiments were carried out in duplicate. After the incubation period, the P chemical forms were obtained by the sequential extraction procedure proposed by Steward and Oades and modified by Borie and Zunino for Chilean soils derived from volcanic materials. Before the experiment, the SS material underwent the same procedure. In addition, the available P was determined in all samples by the Olsen method. The results indicated that after the incubation the soils showed changes in P forms. The P mass balance showed that as result of SS application a higher amount the P was mineralized as compared to the control, in both soils. On the other hand, the residual P content in both soil decreased (69 to 88%), indicating that the incubation and the SS amendment contributed to the solubilization of recalcitrant P forms into more labile forms. The higher the SS rate, the higher the available P after the incubation. The theoretical sum of the available P of the soil and the SS before the incubation is lower than the experimental available P after the experiment. The difference between the theoretical and the experimental measurement increases with the SS rate. These trends were found in both soils. As a result of the changes in the P chemical forms, higher amount of this element is potentially available in the soil for plant growth. Acknowledgments: FONDECYT 1070116 project and graduate students would like to thank PUC-MECESUP (0210) and CONICYT Doctoral scholarships. Keywords: enzymatic activity, drilling cuttings, worm humus. Dehydrogenase activity is associated to microbes breathing processes, which is believed to be more dependent on both metabolic status and general biological activity than any other enzymes within the soil. This makes dehydrogenase enzyme a good microbial activity indicator in the bioremediation process of drilling cuttings polluted soils. The aim of this work is to assess dehydrogenase enzymatic activity as an indirect measurement of soil microbial communities capacity to transform biodegradable hydrocarbons (saturated & aromatics). Soil and mineral oil-based drilling cuttings were mixed up to obtain Oil and Greases (O&G) concentrations about 2, 3, 4 and 5% w/w. For cuttings treatment, worm humus (5% w/w), manure (1.5% w/w) and P:N 32:60 gm-2 fertilizers ratio were added. As a control, cuttingsless soil with the same organic conditioners proportions and P:N 8:15 (gxm2) fertilizers ratio was used. Mixtures were put within plastic cases during 124 days. Both dehydrogenase enzymatic activity and biodegradable hydrocarbons content changes within mineral oil-based drilling cuttings-soil mixtures were measured. Biodegradable hydrocarbons remotion of all mixtures reached about 50% for each different cuttings concentrations for 160 days. After assessment period, significant differences in dehydrogenase enzymatic activity for the evaluated O&G concentrations regarding to control soil (p < 0.05) were found for 124 days. Results suggest that dehydrogenase enzymatic activity during hydrocarbons biodegradation process decreases organic fractions degradation itself. Keywords: Soil, Degradation, Natural Hazard, Iran. As a result of the geographical and ecological situation of Iran, as well as the blowing of unfavorable winds in the Central Desert, more than 80% of the 164 million hectare area of the country is subject to the conditions of arid and semi arid regions, characterized by low precipitation, ranged between 50 to 250 mm per year. At the present the area of the country's deserts and sandy soils is estimated to be 34 million ha, and that of the poor and desertified rangelands which 12 million ha correspond to the sandy, soils 5 million of the same shifting sand dunes. Historical evidences and works remained from the ancient time testify the fact that these regions were covered by desert forests and plants, which were annihilated because of the wrong and excessive exploitation, the result of which has been the diminution of the vegetation resources and the conversion of the lands into deserts. It is estimated that the trends of desertification in the country is about 1% annually. Land degradation causes $10 billion loss to South Asia annually The environmental impact on the countries of the South by soil erosion and other forms of land degradation is all too familiar. A recent United Nations study shows the high economic cost of such land degradations to the South Asian countries. Soil is one of the most vital of our natural resources. Together with water and air, it forms the very basis of life. Indeed, there is a thesis, quite difficult to refute, that the rise and fall of civilizations in history can be linked to the quality and management of their soil and land. For from the soil comes food and other crops and plants that provide medicine, clothing and so many other things we need for daily life. And the retention of soil in its natural state and habitat prevents erosion, river silting and flooding. When land is disturbed or degraded, the ecology is damaged. There can be rather serious effects in terms of soil erosion, loss of soil fertility and thus reduced plant growth or crop productivity, clogging up of rivers and drainage systems, extensive floods and water shortages. Environmentalists are familiar with the above cause-and-effect scenario. City planners and water and soil policy makers have to deal with the problem. And ordinary people experience and live in dread of the bad effects. But soil degradation and erosion is also an economic issue. The loss of soil and its effects cause tremendous losses to the economy. So much so that these costs may well outweigh the benefits of many development projects that give rise to the problem. If only the economic costs of soil erosion (and other environmental ills) were easily calculable. Then planners and politicians would think twice or thrice before allowing activities and projects that damage the land. Enzymatic treatment is currently considered an alternative method for the removal of toxic xenobiotics from the environment. Laboratory experiments demonstrated that the application of various phenoloxidases, such as peroxidase, lacease or tyrosinase, may lead to a complete decontamination of water polluted with phenols and anilines. The feasibility of soil treatment was demonstrated using a lacease from Trámeles villosa. The soil was purposely polluted with 14C-labeled 2,4-dichlorophenol (2,4-DCP) and incubated with the free lacease or the enzyme immobilized on montmorillonite. After 14-day incubation, the binding amounted to 82% and 77% of the initial radioactivity for immobilized and free lacease, respectively. It is noteworthy to emphasize that free lacease proved to be very stable in soil. When aged in soil for 14 days before the addition of 2,4-DCP, the enzyme was able to immobilize 69% of 2,4-DCP. For comparison, immobilized lacease caused a 61% binding after the same aging period. In view of the results, lacease from Trámeles villosa does not appear to require costly immobilization procedures before it is applied for soil remediation. Keywords: Atrazine; andisol; liquid cow manure. Application of animal manure amendments to agricultural soils is a common practice to improve soil fertility through the addition of essential plant nutrients. This practice may increase the potential for pesticides degradation by microorganisms with capacity to decompose these compounds. Andisols in Chile are generally cropped to maize (Zea mays L.) and their management includes the application of liquid cow manure (LCM) at rates higher than 100,000 L ha-1, and the application of atrazine (2-chloro-4-ethylamino-6-isopropylamino-1, 3, 5-triazine) for broad leaf weed control. The application of LCM has produced an increase in weed populations, which has caused farmers to increase rates of atrazine application. In this work, we evaluated the influence of LCM application on atrazine degradation in an Andisol used for maize crop. The LCM was applied at rates equivalent to 0, 100,000, 200,000, and 300,000 L ha-1, resulting in treatments S-0, S-100, S-200, and S-300, respectively. In the laboratory an aerobic incubation was conducted for 30 days. Then, was applied atrazine in concentrations of 0, 1, 2, and 3 mg kg-1. The incubation was realized for 80 days and during this time were determined the residues of atrazine and the main degradation products by HPLC. Chemical analysis of atrazine residues revealed that the herbicide was rapidly degraded after 20 days in all studied soils. The residues of atrazine were from 7 to 13% and 1 to 5% for the days 20 and 40 respectively. Finally after 80 days were not detected residues of atrazine. Results showed that hydroxyatrazine (HA), deethylatrazine (DEA) and deisopropilatrazine (DIA) were detected in the extractable fraction of the amended and unamended soils. After 20 days of incubation, the highest levels were founded for DIA and HA, while that for day 40 of incubation were detected each one of the products but in lower concentration. According to the obtained results, the applications of LCM not modify the degradation of atrazine in the studied soil due to a stabilization of soil after 30 days of the LCM application. Atrazine in all the soils was rapidly degraded probably due to the existence of microorganisms adapted to the atrazine degradation. Acknowledgments: We wish to thank FONDECYT Project N° 1070568 and MECEFRO 0309 for financing. Application of liquid cow manure on soil for agricultural use increase the organic matter content and constitute an important input of nutrients into the soil, increasing microbial activity through the direct addition of nutrients and microorganisms. Moreover these conditions cause the invasion of weeds that leads to increase the herbicide application dose, both pre-plant and postemergent herbicides, especially in cropped to maize, with the consequent environmental impact. The aims of this study are to assess the effect of dose of liquid cow manure (LCM) in the biological processes that modify the behavior of atrazine in the soil-slurry, determining time of stabilization of amended soil. The fluorescein diacetate activity (FDA) and the enzyme β-glucosidase activity are used to measure soil microbial activity. The soil used was an Andisol, belonging to Los Lagos series in Futrono. The liquid cow manure was obtained from the same place. The herbicide is an analytical standard of atrazine (98% purity). The LCM was added to soil at 0, 70, 140 and 200 mL kg-1 and thoroughly mixed in polyethylene bags. The LCM dose used corresponded to 0 L ha-1 (SO), 100.000 L ha-1 (S100), 200.000 L ha-1 (S200), and 300.000 L ha-1(S3OO). The soils were moistened to 70% of field capacity in a dark room at 20°C. The soils were incubated by 1, 10, 20, 30 days. By fulfilling the incubation time, the atrazine herbicide was applied in a dose field (3 L ha-1). The biological activities are assessed in days 1, 10, 20, 30 for each incubation time. Three replicates for each treatment were used. The effect of liquid cow manure in the soil causes an increase in the hydrolytic activity FDA, due to pool of microorganisms that were added, and it is greater in substrates not stabilized. Besides, an increase in FDA activity can be explained by the toxic effect of some herbicides that cause the death of the microorganisms of soil. The breaking of the cells of the microorganisms killed in the soil, releases endonuclease enzymes; the hydrolase enzymes are the most abundant and therefore one would expect a temporary increase in FDA activity. For more than 20 days the values of FDA are similar to the soil. The herbicide application does not produce significant differences on FDA activity in soil. The β-glucosidase activity increased at the beginning of the experiment for all treatments, being more important to higher dose of liquid manure (S300), because the increase of organic matter that was added from liquid cow manure. But the activity decreased with the incubation time to become similar to soil activity. In treatments with herbicide application was not significant differences for all treatments. Acknowledgments: Project FONDECYT N° 1070568 and DI08-2014. andisol. Dimethenamid is a relatively new pre-sowing herbicide applied in Chilean forage maize crop. Some studies indicate that an important concentration of its degradation products in near groundwater to agricultural lands has been found. Also, livestock slurries are applied in forage maize during soil preparation, which increase both the population and aggressiveness of weeds, then decrease the efficacy and increase the requirements of herbicides. Considering this problematic, the aim of this study is evaluate the role of dairy slurry on microbiological processes that regulates the dimethenamid efficacy in slurry amended soils, in order to optimize its use. In this work both microbial respiration and hydrolysis of fluorescein diacetate activity (FDA) were evaluated on dimethenamid application to soil-slurry mixtures at different incubation times. For the mixtures preparation an Andisol (Los Lagos series) and dairy slurry were used. The slurry was applied in equivalent dose to 100, 200, and 300 thousand L ha"1, also a control without slurry was considered. The mixtures were kept in conditions of incubation to 20°C with moisture control and darkness. The samples of amended soils were taken at different incubation times (1-60 days). At moment of sampling, dimethenamid was applied to every mixture to equivalent field dose of 2 Lha"1. For the C02 measurement, the samples were located in closed glass flasks for evaluation by 60 days, whereas for the FDA measurement the samples were incubated again in the previous conditions. The results indicate that when dimethenamid is applied slight differences were observed, both in respiration rate and FDA of amended soil and soil, with regard to the soil without herbicide application. An important rising in C02 production and FDA were observed by increasing the slurry doses. The C02 rate production increased in the first 10 days and then declined reaching stable values from the 20 day. The FDA was low initially but increasing gradually up to reaching high and stable values from the 20 day. Thus, the effect of dimethenamid in the measured parameters suggest that dimethenamid would present a indicating that its degradation in soil could be principally a co-metabolic route and possibly occur a major quantity of degradation products that it must be evaluated, principally in later periods to 20 days where the hydrolytic activity of soil microorganisms was major, which would favor the production of degradation products. Acknowledgments: Project FONDECYT 1070568 andDI08-2014. Keywords: Biosolid; Mollisol soils; nitrogen mineralization. The disposal of biosolids generated by the municipal waste waters plant treatments constitutes an environmental problem. Their disposal on agricultural land every day acquire more relevance, however, in Chile there is not much experience and some research on soil-biosolids interactions are being curried out either in vitro conditions or in field experiments. The purpose of this work was to investigate the possible influence of soil and biosolid chemical properties on the nitrogen mineralization in soils from the Metropolitan Region (Chile) treated with biosolids taken from a landfill in a 3-year period. Three soils classified as mollisols were amended with 0 and 30 Mg dry-biosolid per hectare and incubated for 60 days at 28 °C. Biosolids were taken from the landfill twice a year for a period of three years. Soils and biosolids were characterized for pH, electrical conductivity, total N, organic matter, and total and DTPA-extractable heavy metals. Electrical conductivity (EC), pH, inorganic nitrogen (NO, and DTPA-extractable heavy metals were analyzed after 0 and 60 days of incubation. A principal component analysis (PCA) of the data was performed using the Isfotat software. Before incubation it was possible to: 1) differentiate biosolids according to their chemical properties with more weight and find a negative relation between inorganic (N¡) and high contents of total Cr, Pb and Zn, and a positive relation between N¡ and biosolid EC, 2) differentiate soils parting soil M with the lowest pH (6.4) and highest Cu-DTPA content (31.6 mg kg-1). After the 60-day incubation, the soils amended with biosolids BET-1 and BET-2 presented the lowest rate of mineralization which was associated to the lowest biosolids EC (6.79 dS m-1) and the highest total Cr content (335 mg kg-1 of biosolids) in the case of biosolids BET-1, and in BET-2 to the highest EC (24.2 dS m-1) and the highest Zn-DTPA content. (449 mg kg-1 of biosolid). It is concluded that the rate of nitrogen mineralization in biosolid amended soils from the Metropolitan Region would be independent of soil type but it is affected by heavy metals and the electrical conductivity of biosolids. More research should be done related to the effect on nitrogen mineralization of total heavy metal contents in biosolids and bioavailable fractions of heavy metals in biosolid amended soils before considering biosolid application to land. Acknowledgements: This research was supported by FONDECYT, Project 1080357. Keywords: White rot fungi; biosolid; carbon recycling; lignin. The white rot fungi (WRF) are the main organisms involved in the carbon recycling of the lignin, which utilize an extracellular oxidatives enzymes system. Nevertheless these basidiomycetes causers of the wood-decay, can not use directly the lignin as source of carbon and energy. The ligninolysis process which happens during the secondary metabolism provides bioavailable substrata. Therefore, the WRF produce various isoforms of the extracellular ligninolitic enzymes: laceases (Lac) and different peroxidases, including lignin peroxidase (LiP), manganese peroxidase (MnP) and versatile peroxidase (VP). This last one brings together the catalytic properties of the LiP and MnP. The capacity of these fungi to mineralise an organic compounds variety offers an indisputable potential for use in bioremediation of ecosystems impacted by recalcitrant synthetic compounds. Additionally, its characteristic growth across the development of the hyphes, allows these to colonize different types of substrata, which also can have access to the soil's pollutants. Investigations in the last decade have shown the potential of the basidiomycetes of white rot and its enzymatic extracts for the xenobiotics pollutants elimination such as chlorinated organic compounds, simple and polycyclic aromatic hydrocarbons, nitro-substituted compounds, and modified polymers and dyes. The goal of this research is to study the enzymatic system capacity of the basidiomycete Phanerochaete chrysosporium for the recalcitrant pollutants degradation, especially textile dyes, and its potential use in biorremediation and reduction of environmental impact. The results obtained in in vivo culture indicate that the ligninolitic system of P. chrysosporium presents a partial or total ability to degrade/decolorize various azo dyes. The screening realized in static culture for the 50 mg 1-1 of dye showed decolorizing values between to 99% and 60%, which correspond to Acid Black 1 and Reactive Orange 6 respectively. The evaluation of a continuous system with immobilized fungus which was fed with an increasing dye concentration as supplement of the culture medium indicated that the biological system was capable of responding satisfactorily up to 400 mg -1for the Acid Black 1 and Reactive Blue 5, obtaining a decolorization greater than 70%. The bioreactor showed a stable operation for a period of the 35 d approximately. On the other hand with the purpose of establishing criteria for an effective operational strategy of dyes biodecolorization based on the application in vitro of the extracellular fluid of P. chrysosporium, was analyzed the effect of the Mn II concentration and the H202 dosage in the process kinetics. The decay of the dyes concentration in the time was fitted to an exponential model multistage. In all the cultures, only activity MnP was detected as being identified as the enzyme causer of the decolorizing process. Thermal stability essays of present MnP in the extracellular fluid indicated that the enzyme is stable up to 3 h to 40°C, nevertheless to 50°C was inactivated fastly. Finally it is possible to conclude that the white rot fungi constitute a versatile fungal consortium with high tolerance to toxic substances as the synthetic dyes, which have the potential for its application in the near future, in the biorremediation of wastewaters. Keywords: polyhydroxy acids, Fusarium genus, phenoloxidases. Natural fiber, considered as disposal, when added into a polymer is possible to enhance the material resistance. The study of biodegradable formulation is important because among the polyhydroxyacids, poly (s-caprolactone) (PCL) is more susceptible to the attack by microorganisms in controlled conditions. There are many organisms that are able to degrade biocomposites, but fungi may play a considerable role in degrading synthetic polyesters. Fusarium has many species that are plant and animal parasites. However, this genus is an important pigment producer and it can be applied as bioindicators to characterize contaminated soils by some herbicides as atrazine. Fusarium genus is known to produce enzymes as phenoloxidase, besides other enzyme that would be present in the biodegradation process as depolymerase. Then, the aim of this work was to verify the composite biodegradation containing different percentage of powder of coconut fiber in the presence of two fungi. PCL/starch composite containing 5, 10 and 15 % (w/w) of coconut fiber and the biodegradation were monitored by 60 days. After composite processing, an aerobic biodegradation assay of these materials was carried out. Samples of PCL/starch/fiber and fungal inoculum were added in sterile flasks. The experiment was performed at 28°C, 120 rpm for 60 days with F. oxysporum 07SD and F. moniliforme isolated from soil and kindly give by ESALQ-USP Collection (Superior School of Agronomy, Piracicaba, Brazil). After 60 days of biodegradation, the polymer was removed from the inoculum and gently washed with distilled water, followed by drying. The average molar mass lost and near infrared spectroscopy and morphological investigation of the composite before and after biodegradation was performed using Scanning Electron Microscopy Microscope (SEM) and Atomic Force Microscopy (AFM). The NIR and PCA shows a difference on the biodegradation by fungi between composite PCL/ Starch and Coconut Fiber (containing three different percentage of coconut fiber). The increase of fiber content in the composite was directly proportional to the biodegradation. The same result was observed by the average weight lost evaluation. These results were confirmed by SEM and AFM. Through these techniques was possible observed the fungal attack and the superficial morphology modification, especially the different fiber content. Both fungi present similar composites degradation behavior profile, for the same percentage of coconut fiber without any special culture conditions. However, the best biodegradation result was the composite exhibiting 15% coconut fiber content. Acknowledgements: Thank to FAPESP and CNPq by financial supported and to Wanderson Bueno de Almeida for his support on blend processing. Keywords: hydrocarbons; modified vermiculite; biodegradation. Due to the increasing of petroleum consumption, the numbers of oil spills also increased. In general, for removing oil and organic compounds from the soil, high cost technology are used. However, biodegradation, in situ or ex-situ, could be an alternative of less costly and more important, it is non aggressive to the environment. It is known that the biological treatment of an oil contaminated soil can be affected by the hydrocarbons (HC) structure and by the weathering processes, which decreases the bioavailability of pollutants to microorganisms. Weathering refers to the result of biological, chemical and physical processes that can affect the type of HC that remain in soil, enhance the sorption of hydrophobic organic contaminants as consequence decreases the rate and extent of biodegradation. As a general rule, only the fraction of HC dissolved in the aqueous phase is available for microbiological degradation while the sorbed fraction has a low bioavailability. The process can be enhanced by supplementing soils with modified clays. The chemical modified clay has hydrophobic environment to accommodate the organic contaminants, and mixed with soils can enhance the degradation process and the same time protect the microorganism community from toxic effects of contaminants. Pure clays do not offer the same hydrophobic properties and pure surfactant is expensive. Here, we investigated the biodegradation of naftalene and antracene in soils mixtured with modified vermiculite, common clay in Brazil. The vermiculite was modified replacing sodium and potassium cations by tetramethylammonium. With this modification on surface of the clay a hydrophobic environment was created to accommodate the naftalene and antracene and consequently increase the biodisponibility of both contaminants. Experiments were conducted mixing soil and VT-HDTMA (modified vermiculite) in proportions of 0, 2, 5, 10%, keeping aerobic conditions. The contaminants were spiked to have an initial concentration of 500 mg Kg-1. Samples were taken every 10 days to analyze the presence of contaminants. The experiment was conducted for 90 days. We observed significant depletion of concentration of naftalene and antracene in those soils that VT-HDTMA was present and the time required for depletion of contaminantes decreased. Also the preference for degradation was for naftalene in all experiment with vermiculite was present in the mixture of soil. Finally, we can conclude that the presence of modified vermiculite can reduce the time required for degradation of organic contaminants. The most acceptable explanation for this observation is the increment of biodisponibility of compounds. Keywords: Hydrus 1-D; Volcanic Soil, Pinus radiata. Agriculture in Chile is an important activity which may lead to degradation of the soil, especially of volcanic ash derived soils. To be productive, volcanic soils require frequent adjustments of pH, replenishment of exchangeable Mg2+, and heavy phosphate applications. Municipal sewage sludge (SS), obtained from wastewater treatment processes, ash of the incinerated sewage sludge (SSA), and ash obtained from a Pinus radiata plantation fire (PA), appear to possess essential plant nutrients and dissolved minerals and good buffer capacity. When land applied, they may replenish the depleting nutrient reservoirs in these soils under cultivations. Sewage sludge has the capacity to improve P availability, porosity and hydraulic balance. However, they are also a potential source of pollutants to the soils and groundwater because of their heavy metals concentration and their content of a highly mobile anion such as nitrate. The objective of this work is to study the behavior of nitrate ion in columns of soil using the HYDRUS-ID software for a volcanic soil (Collipulli soil) having a set of experimental data to compare it with that obtained by simulation. Collipulli soil was packed to the depth of 25 cm into acrylic columns according to their field bulk density. On the surface of a column 30 g of SS, SSA and PA were incorporated, to test the capacity of Collipulli soil to retain chemical constituents when land applied. The columns were located in vertical position, flooded once a week with one pore volume of distilled water and drained by gravity for a period of three months. Sewage sludge ash was obtained by heating the SS at 500°C for two hours; PA was obtained at the field under forest fire conditions. Both were added on the surface of the soil column. Results shown that the Collipulli soil was able of retain or gradually release the nitrate. The amount leached depends on the treatment. The application of Hydrus 1-D considers experimental data of Collipulli soil as texture and nitrate affinity. Experimental nitrate leaching data are in good agreement with those simulated by the Hydrus ID program. Therefore, the software should be considered to carry out nitrate transport and leaching studies on volcanic soils. Acknowledgements: DICYT-USACH, MECESUP UMCE-0204, PUC-MECESUP-0210, FONDECYT 1070116 (Chile). The generation of fly ashes is a global problem with severe implications for the environment. Their disposal imply the leaching of toxic substances through the soil to the groundwater, impacting negatively the terrestrial and aquatic ecosystems due to trace elements content in the solid residues, which can be considered harmful to the human health and to the environment. Therefore many investigations are aimed to find new applications for fly ashes as new raw materials and energy sources. The purpose of this study was the chemical, physical and mineralogical characterization of pet-coke fly ashes from fluidized bed combustion (PCFA) and of a low cost adsorbent (AnC) produced from PCFA and a recovered organic polymer from kraft pulp mill (lignimerina). It was too realized a test to determine the heavy metal removal efficiency from aqueous suspensions in batch test. The characterization was performed in order to obtain data about the chemical composition means of X-ray fluorescence (XRF), physical parameters (loss on ignition: LOI, grain size distribution and superficial area BET and crystalline forms of the produced adsorbent means of X-ray diffraction (XRD). The results indicated that the detected crystalline phase minerals in the low-cost adsorbent and PCFA were mainly portlandite, calcite and anhydrite, which corresponded with their chemical composition and data from petroleum coke fly ash, being the major element calcium with a value of a 32.5% (w/w) for the low cost adsorbent and 47% for PCFA. In relation with the physical properties, it was obtained that a 75% of the low-cost adsorbent sample presents a particle size of 3.55 mm, a specific surface area (BET) of 21.5 m2 -1and a medium pore radius of 20.77 Á, whereas PCFA present a lower BET specific surface area (4.66 m2 g-1 ) and small grain size (85um). The copper (II) removal evaluation was performed in simple batch test with control pH between 4 and 5. The results indicated that PCFA and the low cost adsorbent present high affinity for copper, reaching the equilibrium time in 180 minutes with removal efficiency about 90% for the low cost adsorbent and in 240 minutes with removal efficiency near to 100% for PCFA. The adsorption isotherms showed a maximum adsorption capacity of 5.91 mg g-1 for AnC and 4mg/g for PCFA. The obtained isotherm data were attempted to fit with Langmuir and Freundlich models. Accord to the results can state that Langmuir model describe better the adsorption results onto the produced adsorbent, with correlation coefficient between 0.6 and 0.96. Therefore, it can be proposed, that AnC could be used as reactive material in fixed bed technologies to reduce the concentration of heavy metals from wastewaters, due to their high particle size and copper removal efficiency. The low grain size of PCFA induces to think that it will present cementation problems in fixed bed technologies. Therefore, it is proposed that PCFA can be helpful as replacement material of clay layers in landfills to stop migration of heavy metals in soil and groundwater and by this way avoid the damage in the environment. Keywords: Soil nitrogen; tropical forest; pasture. This study was carried out in an area of tropical dry forest with dominant deciduous trees, located in the western Llanos of Venezuela. In this area, forest was converted to pasture by slash-and-burn. Estrella grass (Cynodon nlemfluencys L) is grown for cattle use and is never fertilized. Soils were sampled in natural forest and in two pastures of different ages (5 and 18-year-old) on three periods along the year: at the beginning of the rainy season (May), at the end of the rainy season (November) and during the dry season (March). At each vegetation type, soil samples were systematically taken at twelve points using a 5 cm diameter soil core. At each point, undisturbed soil samples were collected at 0-5 and 5-10 cm depth. Total nitrogen (N) was determined in the soil samples collected at beginning of the rainy season, and was analyzed by digestion with concentrated H2S04. Inorganic N (NH4 and N03) was analyzed in all collected samples, and was extracted with 2M KC1. N mineralization was measured during 15 weeks incubation by Stanford and Smith (1972) method. Microbial N was extracted according to the CHC13 fumigation-extraction method in field-moist samples, and was determined by the alkaline persulfate oxidation method. The concentrations of total N, inorganic N, mineralized N and microbial N were measured using a Technicon Autoanalyser II. The values were corrected to dry soil. For each sampling period, the data sets from forest and pastures were subjected to one-way analysis of variance. Because clay content showed significant difference between forest and pastures, the clay percentage like co-variable to adjust the data was used. Means were separated with Tukey's test when statistical differences (p < 0.05) were observed among sites. A Mann-Whitney nonparametric test was used on data that did not meet assumptions for analysis of variance. Statistical analyses were performed using STATISTICA for Windows 6.0 (Statistica 2001). Soil clay content in the first 5 cm depth varied significantly (p < 0.05) between forest (31%) and 5-years-old pasture (43%). Soil moisture varied across all sites, sampling periods and soil depths, but the variations were not significantly. The highest soil moistures occurred in 5-year-old pasture, where the soil clay content was the highest. Total N concentrations in the first 5 cm were 2.86 in forest and 3.31 and 3.99 g kg-1 in 18 and 5-year-old-pastures, respectively. These values were not significantly different. Microbial N concentration was strongly influenced by land use and season. In the first 5 cm soil, the forest showed the highest concentration (p < 0.05), while the 5-year-old pasture showed the lowest value. The highest NH -N and NO -N concentrations occurred in the 18-year-old pasture, both at 0-5 and 5-10 cm soil depth. The rate of N mineralization varied throughout the 15-week period between sites and depths, and was significantly (p < 0.05) higher in the 18 year-old pasture. Similarly occurred with the potentially N mineralization (No) and N mineralized cumulative (Nm). These results are comparable to others studies of a variety of fertile tropical soils, where the N concentrations and mineralization rates were lower in the young pasture than in the original forest, but they tended to rise with increasing pasture age. Keywords: Microbial biomass; enzyme activities; respiration. The objective of this study was to determine the influence of both tillage and liquid manure application on soil microbial biomass, enzyme activities and microbial respiration in a meadow soil. The results obtained did not show any significant effect of tillage and manure on the microbial biomass C and N nor on soil acid phosphatase activity. However, these treatments significantly increased microbial biomass P, urease, alkaline phosphatase and ammonification rates. The maximum microbial activity was observed in surface soil layer both under conventional tillage and zero-tillage. In fact, microbial respirations (C02) of bacteria and actinomycetes were higher in the surface soil and increased with the level of manure. Tillage and manure application had no significant effect on fungal respiration but interaction between tillage and manure application significantly influenced soil urease and ammonification rates. We suggested that soil microbial biomass and enzyme activities were closely correlated to the N mineralization potential, N and C mineralization rates, total amounts of C orN, soil pH, ammonification rates and soil structural stability. Keywords: Metal degradation; pesticides; fertilizer residues. Metals play a key role in both biological systems as enzyme activators or protein structure stabilizers and in the environment as a major stress factors. Increasing contamination of soil with the residues of fertilizers, heavy metals, pesticides and several other compounds stimulated extensive studies on revealing their leaching properties, bioaccumulation and bioavailability. Influence of the mobility and transformation abilities of these contaminants on the potential environmental risk has lately thoroughly been examined. However in order to gain a complete picture and to be capable of proper interpretation of both environmental and biological implications, degradates of the contaminants should also be taken into account. As studies aiming at revealing interactions between transformation products of pesticides and metals in the soil have not been performed so far, our investigations fill in a real gap in understanding bioavailability and environmental behaviour of major spoil contaminant. It is well known that in some cases decomposition products of pesticides may exert more harmful and toxic effect than the parent compound. In addition to this fact metal ions may be bound to various extent to pesticides and their photolytic transformation products, thus the metal content of the soil influences primarily the fate and environmental impact of the pesticides. The number and chemical feature of the major degradates of some pesticides has already been revealed, however no information is available on their complex forming abilities. The major objective of our research is the thorough examination of the interaction of photoproducts of diverse pesticides with the metal-components of soils. Three distinctive soil types (sandy, browny and alluvial) and four different pesticides (acetochlor, carbendazim, chlorpyrifos, diuron) were involved in our studies. Investigations of the interaction of the degradates with metals extended to iron, copper, zinc, manganese and nickel. The photoproducts of the pesticides were formed by a special UV-source immersed into the suspension of diverse soil samples. Subsequently the degradation products and newly formed complex species were identified by GC-MS and HPLC-MS techniques. The metal-content of the soil samples were determined by AAS apparatus. Our experiment has been carried out via 3 stages: 1) as control samples soils of distinctive types were demetalized by EDTA solution in order the model circumstances in the total absence of metal components. The soil suspensions were treated with pesticides and then UV-irradiated; 2) Normal soil samples (without EDTA-treatment) were handled in the same manner as described above; 3) Solution of metals of different concentrations were added to the soil suspensions, followed with UV-treatment and isolation, then detection of newly formed metal complexes. The revealed interactions and detected new complex species contributes to a more extensive and appropriate interpretation of environmental fate, behaviour, bioavailability as well as possible harmful biological effects of pesticides. Transformation of pesticides in the environment is a highly complex process affected by different factors. Both biological and physical-chemical factors play a role in the degradation, whose ratio depends on the actual environmental conditions. Major goal of our study was to investigate photolytic degradation of distinctive types of pesticides being frequently applied in practice. Relevance of the research is supported by the fact that few information is available on behaviour of pesticides used in agriculture, as well as reaction mechanism of photodegradation is not revealed yet. Our study aims at revealing specific details of photolytic degradation of pesticides as important soil contaminants, and to map biological effects of possibly toxic degradation products. The photolytic degradation of frequently applied pesticides of distinctive types (simazine, chlorphyriphos, acetochlore, carbendazime, EPTC) was effected by UV-light source. A special, immerseable UV-light source emitting light of 254 nm effected degradation. Subsequent to the irradiation of the sample the isolation of the degradation products was carried out by column-, and gas-chromatography. Identification of degradation species was implemented by mass spectrometry. Each of the studied 7 distinctive pesticides (metribusine, simazine, acetochlor, carbendasime, diurone, atrazine, chlorpyriphos) of definitely different chemical structure exhibited definite liability to undergo photolytic decomposition. The degradation mechanisms of the mentioned pesticedes were entirely revealed, and in each case 5 or 6 major degradation species have been detected. Loss of thiomethyl, alkyloxy, alkyl and chloro groups might be regarded as typical ways of transformation. The kinetic aspect of photodegradation was also revealed completely by GC technique displaying significant differences in each case. Significant differences were observed in the kinetic behaviour of the investigated pesticides by GC-monitoring. The kinetic curves of photolytic decomposition made it possible to compare photosensibility and reaction mechanisms of the studied pesticides. 6 distinctive types of soil microbes have been applied as test-species to model and justify harmful biological effects of degradation products. We may claim the pesticide photodegradation may result in significant changes in soil microbiota, as well as formation of biologically harmful side-products. The research on revealing the exact reaction mechanisms of photolytic degradation of pesticides contributes not only to the proper understanding of environmental behaviour of pesticides, but also points out the possible environmental risk factors by identifying possibly toxic degradation products. .
Keywords: Interchange Selectivity; Volcanic Soil, cation interchange capacity, K-Mn. Four thousand forest fires had taken place annually in Chile from VIII to X Region. The soils damage increases with the soil reached temperatures. One of the main effects is the partial or total organic matter destruction which is related to the cation interchange capacity (CIC): K-Ca and K-Mg equilibrium. Interchange reactions consider competitive interaction between the cation and the soil adsorptive sites. The aim of this work is to establish, the temperature effect of heating conditions of the soils during a fire forest event, upon the interchange selectivity. The Ultisols: Collipulli (36° 58' S 72° 09' W) and Metrenco (38° 34' S 72° 22' W); Andisols: Diguillin (36°53'S 72°1(TW), Nueva Braunau (41°19'S 73°06'W) and Ralun (41°32'S 73°05'W), belong to 0-20 cm profile. The cations interchange equilibrium were realized at constant ionic strength (0.05M) on calcined samples at 25°,105°and 500°; the experimental data treatment was performed using Rothumun-Kornfeld semiempired model; due to its advantage compared to other models on the parameter quality. The experimental data indicate that at the calcination temperature the dehydration of organic matter of the Andisol occurred at 25-105°C; from the data it can be observed that the CIC increased; but the pH value at equilibrium are kept constant. However between 105-500°C the cationic interchange capacity decreases as the temperature increases with the resulting increment of pH value at equilibrium due to the organic matter destruction and the carbonates formation. For variable charge soil a pH equilibrium increment implies an increment of CIC. Therefore at 500°C this effect is beyond the magnitude of organic matter destruction which can be proved with the experimental results obtained from the studied Andisols. The changes of CIC and the increments of K selectivity with temperature increment are mainly related to the organic matter changes, rather than on a surface charge modification due to pH alterations at equilibrium. On the other hand Collipulli presents lower organic matter content compared to both Andisols; an increment of CIC is produced as the temperature increases. Ultisols present a greater selectivity for K compared to Ca. and Mg, especially at 25 and 105°C; but Metrenco showed a decrease in the K selectivity compared to Ca; however for K-Mg there is no change with temperature increment which can be a result of the mineralogy. The selectivity for K in the studied equilibrium increases in the studied soils and the sequence selectivity found is: K>Ca>Mg does not varied. Acknowledgment: The authors thank a Project FONDECYT N° 1070116, DICYT-USACH 010741CS, Scholarships VRID and CONICYT. Keywords: Cyclic hydrocarbons; Peaty-podzolic-gleyic soil; polycyclic aromatic hydrocarbons. At the present time, soils are subject to continuously increasing anthropogenic impact. The prediction of processes occurring in soils requires diverse and systematic information on their status. Much attention should be given to monitoring different substances of anthropogenic origin, in particular, polycyclic aromatic hydrocarbons (PAHs), in different natural media, including soils. Most PAHs are toxic, mutagenic and carcinogenic compounds widely distributed in the environment and included in the list priority pollutants in EU and the USA.n The aim of this work was to develop and optimize an algorithm for the determination and identification of PAHs in soils. Experiments were carried out on samples of peaty-podzolic-gleyic soil developed on coarse silty carbonate-free mantle loam at the Maksimovka station, Institute of Biology. These soils are prevalent on poorly drained broad ridges, gentle slopes, and flat depressions of the Komi Republic. The extraction of hydrocarbons was performed with n-hexane of high-purity grade distilled on a fractionating column 0.5 m in height. Ultrasonic treatment was performed in a UZU-0.25 ultrasonic bath (0.23 kW, 18 kHz). The fluorescence of hexane extracts and separated hydrocarbon fractions was measured on a Fluorat-02 liquid analyzer (a 270-nm filter in the excitation channel and a 315-nm filter in the registration channel). Chromato-mass-spectrometric studies were performed on a Shimadzu QP 5050A instrument (Japan). A relatively increased content of PAHs is observed in the upper peat horizons 01 and 02 with a higher microbiological activity and high carbon content compared to the mineral horizons, which can be explained by the formation of PAHs during the decomposition of litter. Peaty-podzolic-gleyic soil has a stagnant-percolative water regime, and peaty-litter PAHs are partly leached from organic horizons and almost uniformly accumulated in the eluvial layer. A zone with an increased content of PAHs is observed in illuvial horizons, which is related to their high density and poor filtrating properties. Deeper, the content of PAHs decreases abruptly down to horizon Cg. Using chromato-mass-spectrometry, PAHs with molecular weights of 166 (fluorene), 178 (anthracene), 202 (fluoranthene, pyrene), 228 (chrysene), 252 (benz[a]pyrene, benz[e]pyrene), and 278 Da (dibenzo[a,h]anthracene) were identified in organic horizons and PAHs structures with molecular weights of 166, 178, and 202 Da were found in the mineral A2hg and A21g horizons. Thus, based on the experimental results, we developed an algorithm for the determination of polycyclic aromatic compounds in soils; optimal conditions were found for the extraction and separation of the PAH fraction. The distribution of PAHs in the profile of peaty-podzolic-gleyic soil was determined by fluorometry and chromato-mass-spectrometry. It was found that both low- and high-molecular PAHs occur in organic horizons and that lighter PAHs are mainly concentrated in mineral horizons. Acknowledgements: This work was supported in part by the Russian Foundation for Basic Research, project N° 07-04-00285 and the Russian Science Support Foundation. Keywords: Microorganisms; wastewater sludge; inorganic nitrogen immobilization. Addition of wastewater sludge to an alkaline saline soil of the former lake Texcoco induced a sharp decrease in concentrations of ammonium (NH4) and nitrate (N03), important nutrients for a planned vegetation of the area. We investigated the factors that control this drop in inorganic N. Soil was amended with NH/, unsterilized or sterilized wastewater sludge while concentrations of NH4+, N02 and N03- and emissions of C02, N20 and N2 were monitored in an aerobic incubation experiment. An agricultural soil of Otumba was treated in the same way and served as control. Addition of unsterilized wastewater sludge increased the C02 emission rate > 2.0 times compared to soil amended with sterilized sludge. The mean concentration of NH/ in soil was significantly lower when unsterilized sludge was added compared to soil amended with sterilized sludge. Addition of sludge decreased the concentration of N03- with 50 mg N kg-1 soil in the Texcoco soil at day 7, but not in the soil amended with sterilized sludge. Emission of N20 in the Otumba soil was mainly due to nitrification, while the denitrification process was the main contributor in the Texcoco soil. Microorganisms in the sludge reduced N20 to N2 when added to the Texcoco soil, but not the soil microorganisms. It was found that microorganisms added with the wastewater sludge accelerated organic material decomposition, increased NH44+ immobilization and induced immobilization of N03- in the alkaline-saline Texcoco soil, while contributing to the reduction of N20 to N2. Keywords: Tillage; crop residues; fertilizer management. A field experiment was conducted from 1998 to 2005 on a Gray Luvisol (Boralf) soil near Star City, Saskatchewan, Canada, to determine the influence of tillage (no tillage -NT and conventional tillage - CT), straw management (straw retained and straw removed) and N fertilizer (0, 40, 80 and 120 kg N ha-1, except no N to pea phase) on seed and straw yield, mass of N and C in crop, organic C and N, inorganic N and aggregation in soil, and nitrous oxide (N20) emissions. The plots were seeded to 4-yr rotation of barley-pea-wheat-canola. Seed, straw and chaff yield, root and C mass, and N uptake increased with increasing N rate for barley, wheat and canola. Tillage and straw treatments generally had no effect on crop yield during the first three years. But, NT produced greater canola seed, straw and chaff than CT, whereas straw retention increased seed and straw yield compared to straw removal for canola in 2001. No-till also had greater seed, straw and chaff yield, N uptake in seed, and mass of C in seed, straw, chaff and root than CT for barley in 2002, but many of these parameters were greater under CT than NT for wheat in 2004 and canola in 2005. Straw retention had greater seed, straw and chaff yield, root mass or mass of N and C in seed, straw, chaff and root in most cases compared to straw removal for barley in 2002, pea in 2003 and wheat in 2004. Total organic C (TOC) and N (TON), and light fraction organic matter (LFOM), C (LFOC), and N (LFON) in soil were generally greater when straw was retained than when removed. Tillage did not affect TOC and TON in soil, but LFOM, LFOC, and LFON were greater or tended to be greater under NT than CT. The NT + straw retained treatment had the lowest proportion (34%) of wind-erodible (<0.83 mm) aggregates and greatest proportion (37%) of larger (>12.7 mm) dry aggregates, compared to highest (50%) and lowest (18%) proportion of corresponding aggregates in CT + straw removed treatment. This suggests a lower potential for soil erosion when crop residues are retained and tillage is eliminated. There was no effect of tillage, straw and N fertilization on NFL-N in soil, but CT + straw retention tended to have higher N03-N concentration in surface soil than NT + straw removed. Concentration of N03-N in soil increased substantially with N rate > 80 kg ha-1. Amount of N lost as N20 was higher from N-fertilized than from zero-N plots, and it was substantially higher from CT than NT plots when N was applied. In conclusion, retaining crop residues along with no-tillage improved some soil properties and may also be better for environment and sustainability of high crop production. Although N fertilization improved crop production, it increased the potential for N03-N leaching and N20-N emissions, when applied in excess of crop requirements. Keywords: Nitrogen emissions; tillage systems; controlled-release urea. If the supply of N is synchronized with crop uptake, the risk of gaseous N emissions to the atmosphere and leaching of nitrate-N to the groundwater can be minimized. A field experiment was established in 2004 near Star City, Saskatchewan, Canada, on a Dark Gray Luvisol (Typic Cryoboralf) clay loam soil to determine the influence of controlled-release/coated urea (CRU) versus conventional urea on seed yield, nitrate-N accumulation in soil and gaseous N20-N loss to the atmosphere. The treatments included two sources of N (conventional urea and CRU), placement methods (side banded - SB, banded - B, broadcast, blend, split), N rates (0, 30, 60 and 90 kg N ha-1) or timing of application (autumn and spring) in different combinations under conventional (CT) and zero (ZT) tillage systems. There was a substantial increase in seed yield with increasing rate of applied N under both ZT and CT, and seed yields and response trends were similar for both tillage systems. The N-use efficiency (kg seed kg-1 of applied N) was highest at 30 kg N ha-1 rate, but it did not produce the highest seed yield. Autumn-applied (banded) urea was less effective in increasing seed yield than spring-applied (side-banded) urea. The effectiveness of Autumn-applied urea was increased with CRU, where it produced higher seed yield than uncoated urea. This also suggests that CRU can be a good fit for winter wheat or other winter cereals or oilseed crops. For side-banded N in spring, CRU tended to produce higher seed yield than uncoated urea, suggesting CRU may have the potential to replace split applications under certain conditions. Split application of N (i.e., a half of N at seeding and the other half at tillering) tended to produce higher seed yields than uncoated urea. Spring 50:50 blend application of CRU and uncoated urea produced higher seed yield than uncoated urea. This suggests that blending urea with CRU may improve efficiency of applied N. Spring applied CRU, blended, and split application treatments all produced similar seed yields. Application of CRU resulted in lower accumulation of nitrate-N in soil in top 60 cm depth at harvest than uncoated urea, thus reducing the potential for N losses over the winter and in spring. CRU tended to reduce nitrous oxide emissions compared to uncoated urea. The findings suggest that under wetter soil moisture conditions in the Parkland region, CRU/coated urea can be an effective management tool in enhancing seed yield, while also minimizing potential for gaseous and/or leaching N losses over the winter and in early spring, particularly for Autumn-applied N. This may benefit both crop yield and environment. Keywords: biosolids; alkylphenol ethoxylates; xenobiotics. Biosolid beneficial utilization as potential fertilizers and their features as soil improvers turn them into a viable alternative, as opposed to a simple buildup of solid wastes. For a safe option in the use of biosolids in forest, agricultural or degraded soils it is necessary to control the presence of pathogenic organisms, heavy metals and organic pollutants. With regard to the last mentioned, biosolids contain high concentrations of alkylphenol ethoxylates which are widely used in commercial and household detergents. These compounds degrade during the wastewater treatment process to their more toxic, estrogenic, and lipophilic alkylphenols. The aim of this study is to develop a rapid and modern extraction methodology to determinate these xenobiotics from biosolids with potential use in agriculture. The analytes studied were 4-nonylphenol ethoxylate (4-NPE), 4-n-octylphenol (4-n-OP), and 4-nonylphenol (4-NP). The extraction methodology developed was based on pressurized solvent extraction (PSE), on an ASE 100 (Dionex). The extraction variables were optimized by a "central composite multivariate design". The variables studied were: temperature (from 40 to 200°C), static time (from 5 to 60 min.) and solvent (different volume ratio of acetone/dichloromethane). This solvent mixture was previously selected among various single and mixed solvents, because it provided a more quantitative extraction. The other working conditions were: extraction cell, 10 mL; flush volume, 100%; purge time, 100 sec. and two static cycles. After the extraction process, the extracts were dried on a glass column, filled with Na2S04, and then concentrated to 1 mL with N2. The extracts were cleaned up on a glass column packed with A1203. A volume of 40 mL of ethyl acetate/toluene (3:1 v/v) mixture were passed through the column in order to elute matrix apolar components. After discard this fraction the analytes were eluted with 20 mL of a diethyl ether/methanol/formic acid (1:1:0.05 v/v) mixture. The solvent was exchanged to methanol, and concentrated to 2 mL previous to chromatographic determination. The final determination was carried out by HPLC-DAD (X=280 nm, C-18 column, mobile phase: 60% Acetonitrile, 40% water, injection volume of 100 ul). The optimal extraction conditions were: temperature, 153°C; static time, 60 min. ; and solvent, acetone. Under these conditions the method was compared with Soxhlet extraction, using the same solvent (200 mL), 2 g of sample, and 24 h of extraction time. When real biosolid samples from Metropolitan Region were analyzed, the sum of the concentrations found for 4-NPE, 4-n-OP and 4-NP by Soxhlet extraction was 219 ± 45 mg kg-1, and by the proposed method 460 ± 75 mg kg-1 . These results indicate that PSE method is much more quantitative than Soxhlet, the extraction time is decreased from 24 h to 2 h and the organic solvent used in the extraction is decreased to 10%. Acknowledgements: The authors thank to FONDECYT (Projects 1070616 and 1080357) and CONICYT (D-21070345) for financial support. Keywords: Cadmium absorption; monocultivation; Chilean soils. Cadmium (Cd) has been one the major trace elements of environmental concern because of its toxicity and mobility in the soil-plant-water system. In Chile, as much as 266 mg Cd kg-1 of P-fertilizer can be incorporated to soils through fertilization. The mobility and transport of trace elements are dependent on the chemical form of the elements and on the ability of the soil to adsorb elements from the soil solution. The objective of this study was to investigate the distribution of forms and the adsorption of Cd in two soils representing the soils used for intensive corn production in central Chile. Soil samples were taken from the 0-25 cm of two Mollisols (Mixed, thermic, Ultic Haploxerolls) a clay loam (CL) and a clayed (C) soil. These soils have been monocultivated with corn over a 15 year period, receiving high-dose application of P fertilizers. Two laboratory experiments were carried out: 1) a sequential extraction method was employed to investigate the adsorbed, mineral and organic phase of Cd in the solid phase of soils; both, the Cd concentration in the soil solution and the total Cd concentration of soils were also determined; 2) adsorption isotherms were carried out applying 20 mL of different Cd solutions to one gram of dry soil (Cd concentrations ranging from 50 to 2000 µg L-1 in 0.01 M NaNOs background solution) and equilibrated for 48 h. After that period, the suspension was centrifuged and filtered. The supernatant was separated for Cd determination and the solid underwent the chemical fractioning procedure to obtain the adsorbed and mineral forms of Cd. In all samples the Cd concentrations were determined by AAS-GF. Total Cd content of soils were 0.27 mg Kg -1and 0.33 mg Kg-1 for the CL and C soil, respectively. These concentrations have been reported for soils under agricultural practices. The greater differences between soils were found in the concentration of Cd in soil solution and in the mineral phase. The Cd concentration in the soil solution of the CL soil was a 57% higher than that of the C soil. The recovery of the sequential extraction method was -93% of the total Cd. The remaining Cd could be considered to be in the residual fraction, which is a very low reactivity phase. About 33%, 45% and 12% of the total Cd of the CL soil are in adsorbed phase, mineral phase and organic phase, respectively. For the C soil, most Cd is in the mineral phase (50%), and lesser amounts are in the adsorbed phase (36%) and the organic phase (9%). The linear partition coefficients (Kd = Cd in adsorbed phase/ Cd in soil solution ratio) obtained from the adsorption isotherms indicate that the ability of the C soil to adsorb Cd was more than 2 times higher than that of the CL soil. The Kd were 455 L kg-1 and 975 L kg-1 for the CL soil and C soil, respectively. After the equilibrating time, most of applied Cd was found in the adsorbed phase in both soils. The amount of Cd found in the mineral phase accounted for the 8% and 12% of the total adsorption in the CL soil and C soil, respectively. Acknowledgments: FONDECYT 1070116. Mauricio Molina would like to thank PUC-MECESUP (0210) Doctoral scholarship and PUC-VRAID international exchange scholarship. Keywords: Acid deposition; sulfur dioxide emissions; nitrous oxides emissions. Acid deposition produced by industrial facilities that emit sulfur dioxide and nitrous oxides affects vegetation, soil and aquatic systems in surrounding areas to the source. Its effects have been widely studied in temperate regions of industrialized countries, but little is known about its magnitude and behavior in tropical regions. Dominant soils in this region are Acrisols and Ferralsols, which are acid soils of variable charge and are considered vulnerable to acid deposition. In the Gulf of Mexico petroleum extraction activities are widely distributed, and large quantities of gases are emitted into the atmosphere. In this region the gas processing facility Cactus is located, which emits the largest amount of S02 to the atmosphere in the entire region. The climate is warming humid and the land surface surrounding Cactus is relatively old (Mid Tertiary to early Pleistocene) and deeply weathered soils have developed. These soils are acid, have a small reserve of basic cations and are rich in quartz and kaolinite type clay minerals as well as iron and aluminum oxides, which have variable charge. The objective of this investigation was to study sulfate deposition, to characterize the soils and their changes due to acid deposition and to evaluate their buffer capacity. Dry acid deposition was quantified by exposing PbS04 capsules at different distances from the source; soil profiles were described and sampled along a transect and at different distances from the facility (0.7, 4, 8, 12 km). Also 3 profiles were sampled along a catena (crest, slope and valley) at the site of largest deposition. Suction cup lysimeters were installed at different depths along the transect to monitor the soil solution. The largest amounts of S02 are deposited within a 4 km radius around the facility (Figure 1). Soils in this area have more acid pH values and a smaller ratio of basic cations to exchangeable aluminum. Weatherable minerals introduced to these soils by the eruption of El Chichón volcano, are almost absent in the soils close to the facility (Fig. 2). Also the soil solution is more acid close to the facility and a larger Ca2+ and S04.2 concentration is observed. The soils near to the facility have the largest buffer capacity, since they are richer in clay and have the largest specific surface. The smallest buffer capacity was determined for the soils at 8 km distance; these soils are more sandy. Keywords: Recombinant Ovine Prion Protein; humic acids, humic-like complexes. According to the "only-prion" hypothesis, prion proteins are the main agents of Transmissible Spongiform Encephalopathies (TSE). Contamination events, through buried contaminated animal carcasses, abattoir wastes or accidental dump, can lead soil to become a potential reservoir of TSE infectivity. As prion protein in infective form is strongly resistant to proteolytic attack, in soil PrP molecules could persist and interact with organic and inorganic colloids by electrostatic interactions, hydrogen bonds, van der Waals forces, etc. Biomacromolecules such as proteins can also be involved in the humification process by phenolic compound polymerisation, through coupling oxidative reactions, catalysed by abiotic catalysts such as Fe and Mn oxides or biotic catalysts such as peroxidases and polyphenoloxidases. The process is very fast and produces a population of polymeric products of different molecular structure and size. Further polymerization, self-assemblage of different polymeric products, and/or association with mineral constituents as well as biomacromolecules quickly lead to the formation of more complex organic and organo-mineral complexes. The aim of this work was to study the entrapment of a recombinant, non pathogenic, ovine prion protein (recPrP) in polymeric aggregates of catechol, a humic-like precursor, obtained by birnessite (8-Mn02) or lacease (from Trámeles versicolor) catalysis. The adsorption of recPrP on humic acids extracted from agricultural soil was investigated, as well. Attention was also focused on the possible release of the protein from humic acids and from the formed organic and organo-mineral complexes, obtained by different catechol concentrations and sequences of addition of recPrP. Desorption and extraction were investigated by using weak and strong extracting agents. The high affinity of recPrP for phenol polymers and organo-mineral complexes promoted the complete entrapment of recPrP molecules in insoluble complexes whatever the catechol concentration or the catalyst. Complete protein adsorption on humic acids was also observed. Extraction tests of recPrP performed with hexametaphosphate and sarkosyl were successful only on humic acid complexes. Conversely solution of sodium dodecyl sulfate (SDS), the strongest agent, allowed extracting recPrP from all the systems. Overall, the results seem to indicate that entrapment and adsorption phenomena involving prion protein actually occur in soil. Furthermore, they suggest that the oxidative polymerisation of humic precursors can strongly immobilise recPrP. Therefore similar processes occurring with the infective protein could represent a mean to avoid the dissemination in the environment. Keywords: Micellization; surfactants; thermal parameters. micellization ΔH°M for most of the surfactants is positive i.e. ΔH°M > 0, interpret that micellization process for all these surfactants is endothermic. From the large and highly positive values of standard entropy change of micellization (ΔS°M) for all surfactants, except SDS, it can be deduced that the system becomes more and more random after micelle formation. The sum of ΔH°M and TΔS°M is free energy of micellization (ΔG°M) which appeared to be negative for all surfactants enumerates that micellization is a spontaneous process. Keywords: Dimethenamid; (3-glucosidase activity; liquid cow manure. J. Serrano*, D. Pérez-Pantoja and B. González. Keywords: Aromatic compounds degradation genes; Cupriavidus necator; Acacia caven. Cupriavidus necator JMP134 is a soil (3-proteobacterium possessing a wide catabolic versatility towards aromatic compounds, being capable to use 2,4-dichlorophenoxyacetic acid (2,4-D), a powerful herbicide and soil pollutant, as a single carbon source. This bacterium was isolated from Australian soil impacted with 2,4-D used to eliminate weeds from agricultural soils, such as Mimosaceae family plants. The performance of soil bacteria is determined by both biological and physicochemical factors, like carbon source availability, pH and plant root exudates. The exudates comprise different molecular weight compounds such as proteins, amino acids, enzymes, aromatic compounds, and other secondary metabolites secreted by the plant into the rhizosphere. These can range from 10% of the net carbon assimilation by a plant, to as much as 44% of plant's total carbon. Soil microbes take advantage of this abundant carbon liberation, and modulate the expression of their catabolic genes to utilize these growth substrates. The aim of this study was to analyze the effects of the root exudates oí Acacia caven (a Mimosaceae widely distributed in Chile), on C. necator JMP134 catabolic gene expression. In order to determine the ability of C. necator JM134 to utilize A. caven exudates as a carbon source, root exudates were collected from the plant after 24 days of growth in hydroponic cultures. C. necator was found to grow on exudates as sole carbon source 4 h after inoculation. To assess the expression of catabolic genes in response to A. caven root exudates, transcriptional fusions of catabolic gene promoters to the lacZ reporter gene, were constructed. (3-galactosidase activities were measured in C. necator derivatives harboring these fusions, when exposed to root exudates for 5 h. We found induction of nagAa promoter gene, involved in the salicylic acid degradation, mediated by these exudates; salicylic acid is a secondary metabolite of plants. Furthermore, we also found that these exudates induced, pcaUF and pcaHQ genes, belonging to two central catabolic pathways for aromatic compounds degradation in bacteria. This work reports relevant information about the catabolic gene modulation in response to natural compound mixtures such as root exudates. Root exudates might improve bacterial adaptation and survival in soil, by stimulating both gene induction and growth, and thus may have positive effects on bacterial degradation of pollutant compounds. Acknowledgements: Funded by grants FONDECYT 1070343 and NM-EMBA P04/007-F.
Keywords: Furrow irrigation; drought; soil infiltration. Drought and water crisis (especially in resent years) has covered a vast part of Iran and aused a great concern among the farmers and officials. In order to solve this problem, few strategies can be suggested. Taking long-term decision for increasing should the efficiency of irrigation is strongly suggested. At the same time ways in which the customized irrigation is optimized must be studied. An old way of irrigation in the country in large scale has been furrow irrigation that unfortunately no attempt has been made to optimize this method. Different designs for furrow irrigation are offered the most important of them are: 1) S.C.S method, 2) F.A.O method, and 3) walker and skogerbo method. The present study is offering a design method that is suited according to environmental conditions and the results obtained from this study. Attempt was mad to identify the efficient length of the furrow. Keeping these in mind, a study field in Amirabad farm of college of Agriculture at Birgand University was chosen. Because in furrow irrigation the slop for land leveling slope distribution is very important, preparing the land and leveling was carefully done. Research on the soil infiltration (Double ring and input-output methods), advancing time and delaying time and measuring furrow cross section in different steps of the study. Keywords: Soil-water interface; contaminant sorption; NMR spectroscopy. Contaminant sorption to soil organic matter (OM) is the main fate of nonionic, hydrophobic organic contaminants in terrestrial environments and a number of studies have suggested that both soil OM structure and physical conformation (as regulated by the clay mineral phase) govern contaminant sorption processes. A great deal of this evidence has come from macroscopic observations with contaminants and soil fractions as well as a recent mass balance approach where the sum of the parts exceeded the whole suggesting that the physical arrangement of OM in organo-mineral complexes may be more important than OM structure in sorption processes (Bonin and Simpson, 2007). In addition, recent studies with constructed organo-mineral complexes have suggested that aliphatic OM is preferred over aromatic moieties and suggests that clay minerals play an indirect role by governing the sorption of organic contaminants by controlling the surface accessibility of OM at the soil-water interface (Feng et al., 2006; Simpson et al. 2006). To investigate this further, a number of soil samples were characterized by both solid-state 13C Cross Polarization Magic Angle Spinning (CPMAS) NMR and :H High Resolution Magic Angle Spinning (HR-MAS) NMR. HR-MAS NMR is an innovative NMR method that allows one to examine samples that are semi-solid using liquid state NMR methods (ie: observe :H which is more sensitive than 13C). With HR-MAS NMR, only those structures that are in contact with the solvent are NMR visible thus one can probe different components within a mixture using different solvents. The :H HR-MAS NMR spectrum of a grassland soil swollen in water (D20) is dominated by signals from alkyl and O-alkyl structures but signals from aromatic protons are negligible (the peak at ~8.2ppm is attributed to formic acid). When the soil is swollen in DMSO-d6, a solvent which is more penetrating and capable of breaking hydrogen bonds, aromatic signals are visible suggesting that the aromatic structures are buried within the soil matrix and do not exist at the soil-water interface. The 13C solid-state NMR data confirms that aromatic carbon is present in substantial amounts (estimated at ~ 40% of the total 13C signal) therefore, the lack of 1H aromatic signals in the HR-MAS NMR spectrum indicates that aromatic structures are buried and that the soil-water interface is dominated by aliphatic chains, carbohydrates, and peptides. The NMR data indicates that the mineral component of soils governs the physical conformation of OM at the soil-water interface. Consequently, one must consider that one-dimensional NMR methods provide an excellent overview of all the structures that are present but they do not provide direct information regarding which structures are available or accessible at the soil-water interface for contaminant interactions. J.L. Bonin andM.J. Simpson. (2007). Environ. Sci.Technol. 41: 153-159. X. Feng, A.J. Simpson and MJ. Simpson. (2006). Environ. Sci. Technol. 40: 3260- 3266. AJ. Simpson etal. (2006). Langmuir 22:4498-4503. The secondary sludge from pulp and paper industry contains high organic matter content, nitrogen and phosphorus and, low concentrations of heavy metals. This residual may presents an alternative as soil amendment improving physical, chemical and biological properties of the soil. 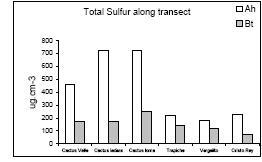 The aim of this study was to evaluate the effects of the addition of different doses of the sludge (0, 10, 20 and 30 Mg ha-1) on Lolium perenne production in volcanic soil (Freiré Series) in field assays. The sludge was incorporated in the first 5 cm soil depth, and Lolium perenne seeds were sowed after 20 days of incubation. The assays were maintained for 135 days and at days 45, 75, 105 and 135 the plants were cut and soil and plants were analyzed, as well as the microbial diversity using molecular techniques (DGGE) was evaluated. The sludge addition improved physical and chemical properties of the soil increasing macro and micronutrients, as well as Lolium perenne biomass production. Soil pH rose from 5.50 to 5.72 with the highest dose of sludge, organic matter increased significantly from 10.59 to 17.18 with the addition of 30 Mg ha-1. The biomass production in each cut increased with the increment of sludge addition. It is necessary to emphasize that with the minimal dose of 10 Mg ha-1 of sludge, the biomass values were higher than values obtained with the control from the first stage (day 0) up to the final stage evaluated (day 135). It was also observed an increment in nitrogen and phosphorus content in aerial biomass, with significant difference between 30 Mg ha-1 sludge dose compared with the control. The analysis of the microbial diversity showed that the application of the sludge does not modify the microbial community of fungi and bacteria even in the high doses applied. According to the results, secondary sludge from pulp and paper industry improved volcanic soil (Freiré Series) increasing all micro as well as macronutrient content. The addition of sludge increased the availability of nutrients in the soil, therefore increasing its productivity. The highest production of Lolium perenne biomass was obtained with 30 Mg ha-1 in field experiments. Acknowledgements: Investigation financed by FONDECYT 1080427, and DIUFRO GAP-2007 projects. Red clover (Trifolium pratense L.) is one of the main forage legumes grown in North America and Europe. Soil-climate conditions in southern Chile are also favorable for the establishment of red clover stands. Although red clover is considered a perennial plant, the production decline to unsatisfactory levels within two years (Steiner & Alderman, 2003). The main factor associate to this reduction is the root borer, Hylastinus obscurus (Marsham) (Coleóptera: Scolytidae). At present there is no control for clover root borers other than crop rotation (Aguilera et al., 1996). Because this borer is an underground pest, chemical components that are associated to the root-ground matrix could have a role in the host acceptance by the root borer. This behaviour could be modulated by chemical compounds released to the rhizosphere. These compounds could vary quantitative and qualitatively through the time depending of the genotype. This study investigated the role of volatile compounds released from different aged of seven line and two cultivars of T. pratense. Seasonal variation of the olfactometric responses was also studied. Behavioural responses of the borer stimulate by different extracts was evaluated in an olfactometer and registered by means the software EthoVision 3.1. The results showed that root extracts of the seven lines and two cultivars were more attractants as the plant increased its physiological age. Plants of 7 months-old were attractants, however those of 3 months-old did not have a significant effect on the olfatometric response of H. obscurus. There were not significant differences among the olfactometric activities elicited from root extract of both lines and cultivars in different stages of growth. Keywords: Root extracts; Trifolium pretense; Hylastinus obscurus. A. Aguilera, E. Cisternas, M. Gerding and H. Norambuena. (1996). Plagas de las praderas. En: I. Ruiz (ed.) Praderas para Chile. INIA-Estación Experimental Carillanca, Temuco Chile, pp. 309-339. J.J. Steiner and S.C. Alderman. (2003). Crop Sci. 43: 624-630. Arsenic mobilization in soils is controlled by sorption/desorption processes, but arsenic also may be coprecipitated with aluminum and/or iron in natural environments. Coprecipitation involving arsenic with aluminum or iron has been studied because this technique is efficient for the removal of arsenic from polluted waters. We studied the mineralogy, surface properties, chemical composition and reactivity toward phosphate of aluminum, iron and mixed iron-aluminum (Fe/Al molar ratio of 1.0) oxides formed in the absence or presence of arsenate (initial As/Al, As/Fe or As/Fe+Al molar ratio (R) of 0, 0.01, or 0.1) and at pH 4.0, 7.0, or 10.0 and aged 30 or 210 d at 50°C at. The removal of arsenate by phosphate from the samples formed at R = 0.1 was also studied. The samples were characterized using XRD, FT-IR, XPS and trasmission electron microscopy (TEM). The chemical composition of the precipitates was determined by treating the samples with NFLpoxalate/oxalic acid or with 6 M HCl. In aluminum systems and in the absence of arsenate, gibbsite (pH 4.0 or 7.0) and bayerite (pH 10.0) formed, whereas in the presence of arsenate the formation of short-range ordered materials was promoted. Poorly crystalline boehmite formed at pH 4.0 (R = 0.01 and 0.1), 7.0 and 10.0 (R = 0.1) and did not transform into Al(OH)3 polymorphs even after prolonged aging. In iron systems and in the absence of arsenate (R = 0) goethite and/or hematite (with ferrihydrite at pH 4.0 and 7.0) crystallized, whereas at R = 0.01 formation of ferrihydrite increased and hematite crystallization was favoured over goethite. At R = 0.1, ferrihydrite formed in all the coprecipitates and remained unchanged even after 210 d of aging. Finally, in mixed iron-aluminum systems, in the samples formed at pH 4.0 (aluminous) ferrihydrite predominated, whereas in the precipitates obtained at pH 7.0 or 10.0 and R = 0 or 0.01 gibbsite and ferrihydrite or bayerite, gibbsite, hematite with small amounts of ferrihydrite formed, respectively. The coprecipitates obtained at pH 7.0 or 10 and R = 0.1 showed presence of ferrihydrite and poorly crystalline boehmite. The surface area and chemical composition of all the samples were affected by pH, R, and aging. Arsenate was found to be present mainly into short-range ordered materials. The sorption of phosphate onto the precipitates was affected by the mineralogy, specific surface area, amounts of arsenate in the oxides and chemical composition of the samples. The presence of short-range ordered materials, mainly those richer in aluminum, facilitated phosphate fixation, whereas arsenate present in the samples prevented phosphate sorption. Low percentages of the total arsenate coprecipitated in the samples formed at R = 0.1 were desorbed by phosphate, but usually more arsenic was removed from the samples synthesized at pH 10.0 than from those formed at pH < 7.0. A comparison of the desorption of arsenate by phosphate from aluminum-arsenate, iron-arsenate and iron-aluminum-arsenate coprecipitates evidenced that phosphate has a greater capacity to desorb arsenate from aluminum than iron sites. Finally, we found that more arsenate was desorbed by phosphate from metal oxides on which it was added immediately after their formation than from oxides obtained coprecipitating the metalloid with aluminum and/or iron, attributed to partial occlusion of some arsenate anions into the framework of the coprecipitates. Common methods for remediation of pentachlorophenol (PCP) contaminated materials include land disposal, incineration, soil washing, and chemical extraction. Biodegradation by bacteria or fungi and phytoremediation by plants can destroy or transform this contaminant to less bioavailability forms. The degradation of PCP occurs under aerobic and anaerobic conditions in soils, and plant, bacterial and fungal extracellular phenol oxidases plays an important role in the degradation of this contaminant. The aim of this work was to evaluate the effect of PCP concentration on ryegrass rhizosphere and biomass production. The soil used in this study was an allophanic soil (Andisol) which was collected from 0-20 cm depth, and sieved (>2 mm). The assays were conducted using mini rhizotron system with 620g of allophanic soil, moistened to 65% of its water holding capacity, and contaminated with 50, 100 and 250 mg kg-1 of PCP. Rye grass (Lolium multiflorum) seeds were germinated, put on Taylor and Foy nutritive solution for 2 weeks. Six selected plants were place on the top of each rhizotron, and samplers were installed to collect soil solution. The rhizotrons were maintained at 20°C in controlled temperature chamber, and periodically the soil solution was collected and analyzed for PCP and organic acids concentration. At the end of the experiment the soil of each rhizotron was analyzed for PCF and peroxidase activity, and plants for aerial and radical biomass. The allophanic soil used in this study (0-20 cm depth) presents pH of 5.9, organic matter content of 14.6 and carbon and nitrogen ratio of 11. Particle size distribution for the soil was 16.5 % sand, 58.2 % silt, and 25.7 % clay, and the relationship from Al203/Fe203/Si02 was 18.6/10.5/41.6 %, respectively. This soil possesses a highly pH-dependent variable surface charge, and presents a high adsorption capacity due to its physicochemical characteristics, mainly its high level of Al, Fe and Si oxides. The adsorption properties of chlorophenols are controlled largely by their degree of substitution and the resulting hydrophobicity. PCP presents a high affinity with soil organic matter, associated with their log Kow value (5.01) and the pKa value (4.75), being the adsorption strongly affected by soil pH in allophanic soil. The contamination of the soil with PCF affected Ryegrass biomass production. The total dry matter biomass (aerial and radical) obtained decreased with the increment of PCF concentration. The biomass of the samples with 50, 100 and 250 mg kg-1 of PCP was 17.3, 18.5 and 29.6 % lower than the control sample without PCP. Acknowledgements: Investigation financed by FONDECYT 1050614, CONICYT-CSIC 2007-144 and DIUFRO GAP-2007 projects. Keywords:Microbial; Respiratory Activity; Salmon-Farming Wastes. Contamination of aquatic fresh water ecosystems is of great concern in salmon farming industry. Water is the most important vehicle for the transmission of organic polluting agents, and for that reason the sediments (sludge) close to salmon facilities could become enriched reservoirs of the pathogens and chemicals. In this work a methodology is presented to quantify the biological stability of wastes from a salmon ground-farming pisciculture and a lake-salmon farming located in Los Lagos Region, Chile. It was accomplished by means of respirometry tests in samples under closed incubation in laboratory. Respiration is one of the oldest parameters and more frequently used to quantify microbial activity in the soil, and it is related to the decomposition of organic residues. The metabolic activity of the microorganisms can be quantified by means of the CO2 production, or by the consumption of O2. The aim of this study was to quantify the amounts of salmon-farmed wastes that are possible to amend to soils in a sustainable way to agricultural soils through the CO2 production accomplished by microorganisms. Incubations performed with salmon ground-farming waste showed stability values around 2 mg C-CO2 g-1 MO d-1 at about 55 days. On the other hand, for salmon lake-farming waste stability was obtained at about 35 days. The results showed that the microorganisms increased their respiratory activity along time and increased sludge concentrations, so indicating the amount of sludge that is possible to dispose or spill into a soil without adverse environmental effects. Data obtained was relevant on showing that salmon-farmed wastes can be used as nutritional source for Patagonian degraded soils of the southern Chilean region. It is necessary to carry out future investigations to determine the role of the different mechanisms involved in the C mineralization from salmon wastes. The procedure described in this work can be used as a useful tool to determine the biological quality produced by salmon industry with possibilities of recycling in agricultural soils, without producing negative impacts in the environment and people,s health. Acknowledgments: This work has been financed partially by DIUC Nº 205. 153.17-1sp, Universidad de Concepción, Chile.